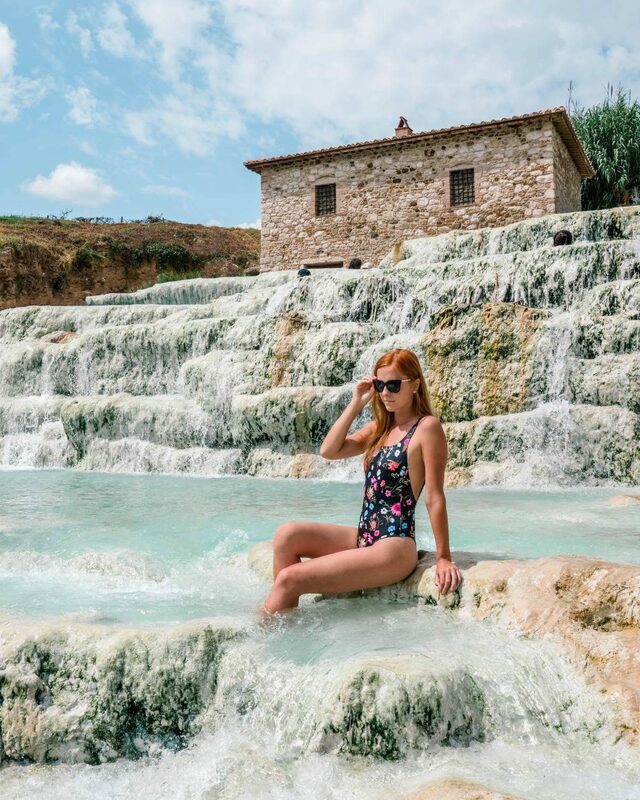 While my personality and dresses have been inseparable after my post on where to find affordable dresses, many of you ask me: what about swimsuits? Because I spent 1,5 years living on the beach in Playa del Carmen and a year in Los Angeles, I’m always on the lookout for cute bikinis. Swimsuits can be insanely expensive. Quite often when I look at prices of some of the Instagram-famous swimsuit brands, I keep wondering who pays $300 for these? While I can understand the designer part, unfortunately, many of those brands actually buy cheap swimwear in bulk from Chinese companies, repack them nicely and boom – sell the same items at ten times the price you could actually get yourself — if you purchase directly from the retailer. The good news is that you don’t have to spend a fortune to own a few cute bikinis. 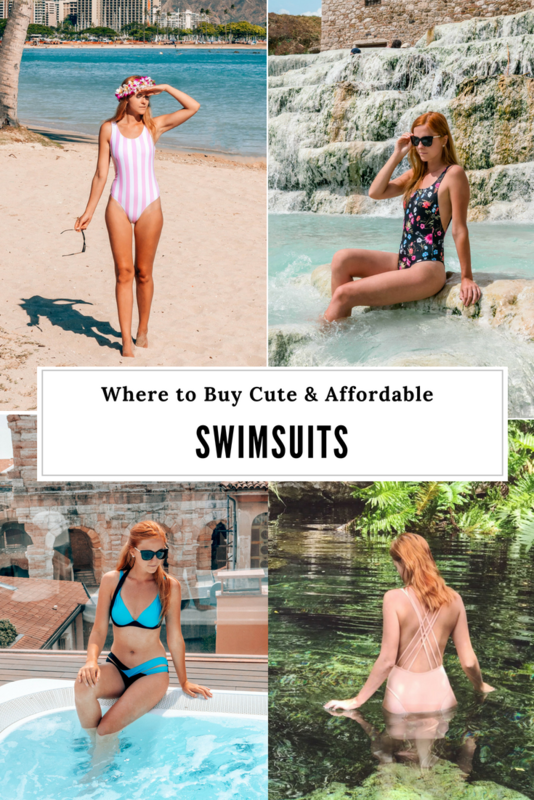 Here are my recommendations for the best stores that sell affordable swimsuits. Where to Buy Cute Swimsuits? Since we’re talking about affordable swimsuits, here’s my great money saving tip for online shopping. About a year ago I found out about Ebates and so far I got $300 back for the items I bought. What is Ebates? It’s the largest Cash Back site which partners with over 2,500 of biggest name brands. Basically, you get cash back for every purchase you make. The best part is that you don’t need click through million things, but simply install a browser extension. It will start flashing red for the participating store, and all you have to do is to activate the cash back at checkout. Ebates can also apply coupon codes to pay even less for your shopping on top of the regular cash back. It’s totally safe and secure, as 3 million other people are using it too. Ebates is running flash cash back deals from 7/16 – 7/18 with double to triple cash back at nearly 100 different stores. SheIn is my number one store these days for clothes and swimsuits. It’s very cheap and the quality is basically the same as at other stores. Do check their size charts for every single product. 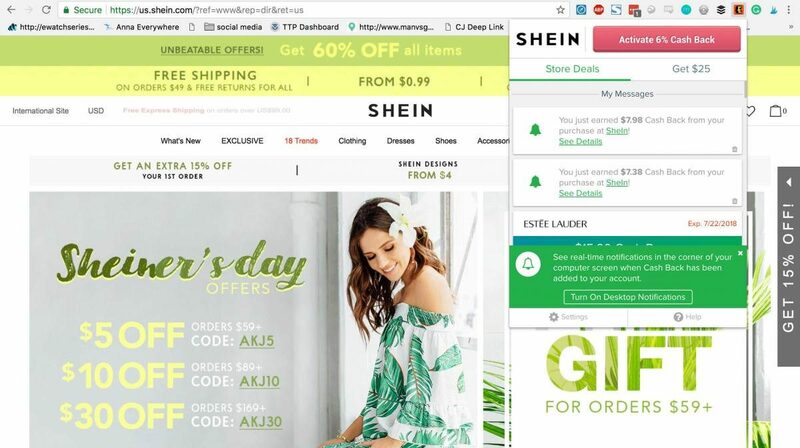 Return Policy: Returns with SheIn within the US are free, quick and painless. I’ve never had an issue and they always refund on time. Another very affordable brand that has some of the cutest and trendiest swimsuits out there. I tend to order UK size 8 from them and they usually fit. Return Policy: Returns aren’t free, but refunds were quick and easy for me so far. ASOS is a store that offers items from many brands, both expensive and cheap ones. Their selection of swimsuits is huge. Return Policy: Their customer service could not have been better. I have to admit I was quite hesitant to order anything from Yoins. The company had pretty bad reviews and clothes seemed way too cheap. However, so far Yoins has not disappointed. As the name indicates this store sells bikinis. You’ll find absolutely every single model out there, so prepare yourself. I usually order size S from them. Return Policy: I didn’t have to return anything from them just yet, so can’t judge their return policy. Amazon is a good place to buy affordable and cute swimsuits for women. I like that returns are easy and you can usually rely on other people’s reviews. Return Policy: Amazon returns are always great. Newer brand that never failed me so far. Their one-pieces and bikinis are adorable! Which swimsuit is your favorite? Any questions? Ask ahead in the comment sections below! I know, right? In fact, I think their customer service has been amazing. Once my order has been delayed and they automatically added some points to my account even thought they didn’t have to. I know, right? In fact, I think their customer service has been amazing. Once my order has been delayed and they automatically added some points to my account even though they didn’t have to. This is super great, I love all the one pieces you’ve posted! Some beautiful choices, personally for me it’s the Isabella Rose bikini it’s so gorgeous as are you! OMG! That sidestroke swimsuit is stunning, I love the colors and the fact that it’s high wasted. I love buying swimsuits of Boohoo they’re pretty affordable and a really good quality. I love to buy and wear a swimsuit because of its look glamorous and stunning. Zaful and cup she offers cute and stunning swimsuits. I love these stores to buy swimsuits. I bought a swimsuit for my sister on Zaful at an affordable cost with Dealhack coupon. Your pictures are great! Please teach me your ways. My favorite is the pink striped one from SheIn but I’m drawn to the side stroke from Summersalt.